The innovative Danish pump and mixer product developer, Landia, is notable for still being a family-owned company, probably uniquely for the manufacture of anaerobic digestion pumps. This is despite the fact that it was founded way back in 1933. It’s claim to fame originates right back in 1950, when the company invented the first really workable electric pump for pumping difficult fluids, by being the first to incorporate the inclusion of rotating knives, within a pump. From that day to the present, Landia has concentrated on the provision of products for the “dirty”, water pumping and mixing sector, by developing new products to serve each developing market as they evolve within the water and waste water, and farming sectors. Unsurprisingly, although it may be, Landia’s equipment also excels in the clean water sector, as well, but it is in the AD equipment market that Landia has identified a need for new products. While interest was been growing worldwide in renewable energy from biomass through the Anaerobic digestion process over the last 5 years, Landia was quietly developing new products to meet the emerging demands for specialist pumping and mixing equipment, within this emerging industry. The product that they came up with, took the company right back to its roots, and drew on their long-standing skills to produce a new range of bladed pumps, which it has named its “Chopper Pumps Range”. The Landia Chopper Pump, we understand, is in heavy demand despite the current economic downturn, and is increasingly used all over the world. It combines the functions of pumping with a very robust chopping action. 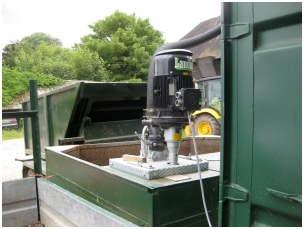 Designing anaerobic digestion pumps, suitable for pumping such materials is notoriously difficult. 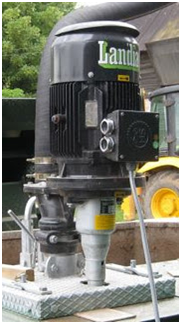 However, users have attested to the fact that this pump reliably provides long term blockage-free running, at a low running cost, and even when handling highly variable feedstocks on-farm and in the digestion of MSW wastes, and sewage works sludges. The video below showers a Landia chopper pump configured in their Gasmix system, to provide a digester with mixing, and scum removal. The result is that these anaerobic digestion pumps provide an improved gas yield from enhanced digestion rates. Landia competes successfully internationally, with over 75% of Landia’s business being exported. Landia pumps, mixers and process units are also in successful use across numerous other industries in facilities which include sewage treatment plants, anaerobic digestion and biogas plants, agricultural biogas digesters, and fish processing factories, plus having interests in the food and brewing sectors. Right across the waste management and biogas industry Landia shows its experience and skills as specialist designer/ manufacturers. In fact the company prides itself on high quality products and providing a back-up service to its customers which they think, with a good measure of justification, is second to none in their industry niche. Visit Landia’s website for more information on the Chopper Pump. I think this is a really good article on a subject in anaerobic digestion which is often neglected. I do think I must thank you. Thank you. Plenty of advice. The chopping action of the knife is good to prevent blockage from unexpected things which get into the mixture.